I mentioned in an earlier post that I do not use oak barrels for fermenting. So what do I use? Well, the answer varies depending on the style of wine I want to make, since the type of fermenting container does have an affect on the final wine, especially for the secondary fermentation and aging casks. Many modern wine makers use stainless steal for both primary and secondary fermentation. Which is a good choice if you want to make a fully reductive wine. I prefer an oxidative primary, then either a reductive (white) or semi-oxidative (red) secondary wine making style. It is more traditional, and “oak barrel like”, to have a semi-oxidative secondary and storage container. Aside from stainless steal, I have found HDPE plastic to be an excellent multipurpose container, and I often use HDPE as the primary fermentation container for all my wine types. Because it is semi-porous to oxygen (similar to a two year old barrel) it also can be used for a secondary fermenter or short period storage/aging container. Some of my HDPE plastic barrels in various sizes. 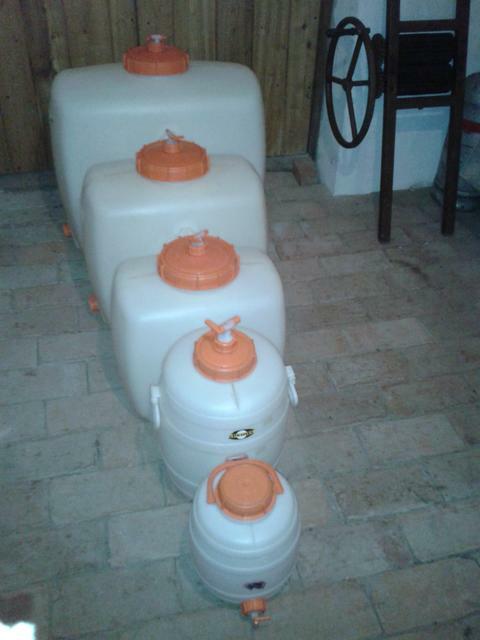 Back to front: 200 l, 100 l, 60 l, 30 l, 12 l. Note: the spigots have been placed on top simply for storage convenience. HDPE is a very convenient container. Extremely large casks in the hundreds of liter size can be easily carried by one person, and they are easy to clean and store when not in use (being light plastic they are very stackable when empty). And HDPE is a very food save plastic. Unlike other common plastics used as containers, it does not leach Bisphenol A . One of the main drawbacks of HDPE is that once polymerized this plastic is forever in the environment. It breaks up into smaller and smaller parts, but it never degrades. Ever. While it can be, in theory, recycled, in reality used HDPE either ends up in land fills, floating in the ocean, or is merely downcycled. Two of the larger manufacturers of HDPE tanks for wine making are Flextank and Speidel (Germany).